In the industry of TVs, Samsung is the leader when it came to functionality and their smart features. Nowadays, its range has somewhat crept up in price over time, but most people should still find a TV that suits their needs within it. As Samsung TV is equipped with USB port, it is convenient for you to put movies on USB flash drive and play on Samsung Smart TV via USB port. For those friends who have bunch of DVD collections, ever thought of copying and watching DVD movies on Samsung TV via USB? Well, in this article, we will share the best way with you to watch DVD movies from an USB port on Samsung TV. For DVD movie lovers and collectors, we all know that purchased DVD movies are copy protected and we can't copy DVD medias to USB Flash Drive or Pen Drive for watching on Samsung TV directly. In order to copy DVD to USB Flash Drive, we will need to find a program that can help you remove the copy protection and rip DVD to unprotected digital videos, such as MP4, MKV, AVI,WMV, MOV, etc. After that, you can copy ripped DVD video to USB for watching DVD movies on Samsung TV from USB port. As you know, there is a large amount of DVD ripper applications in the current market. To complete your task quickly, here Pavtube Video Converter Ultimate is highly recommended for you. With this powerful software you can rip any commercial DVD movies to Samsung TV supported video files with fast speed and excellent output quality. In addition, this DVD ripping tool can also rip Blu-ray or convert video files to various popular video formats like AVI, MP4, WMV, MPEG, MOV, FLV, MKV, 3GP, etc. as well as convert your source media files to optimized video for playback on iPad, iPod, iPhone, Samsung smartphone, Android tablet, game consoles and more. In a word, with this software you don’t need to worry about video playback issues any more. No more talking, let's go straight in. First you need to download this program and get it installed. If you are a Mac user, you can turn to Pavtube iMedia Converter for Mac (macOS 10.13, macOS Sierra, Mac OS X 10.11 El Capitan included), which has the same function as the Windows version. Then let's see the detailed guide to use Pavtube Video Converter Ultimate to watch DVD movies from an USB port on Samsung TV. How to Rip and Copy DVD to USB Drive for Samsung TV? Insert the DVD disc into your computer's DVD drive and launch the DVD to Samsung TV converter. Then click "Load DVD" icon or "File">"Load from disc" to select and import the DVD files you want to rip to this program. If necessary, loaded files can be previewed in the right viewing window and you can take snapshots of your favorite movie scenes. Besides DVD, you can also load Blu-ray discs, Blu-ray Folder, Blu-ray ISO Image File for watching on Samsung TV. USB drive supports storing almost all kinds of video formats. However, when linked to a device for playing, the video file should of the format compatible with the device. So here you are required to output Samsung TV playable video format. 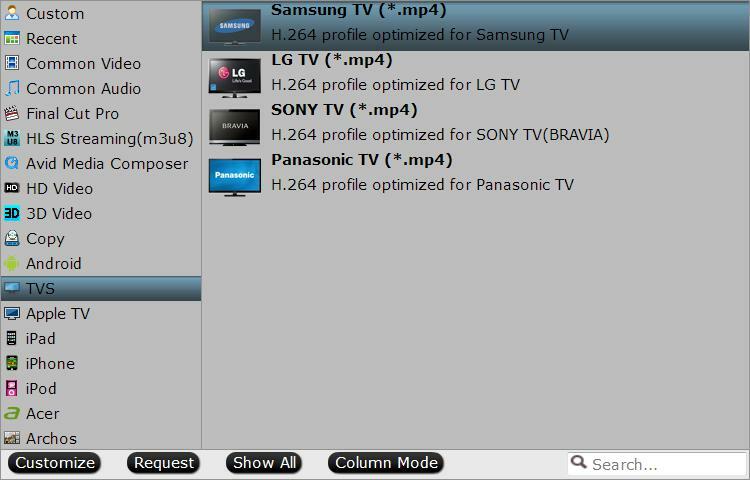 From "Format" bar drop-down list, select one of Samsung TV playable file formats such as "H.264 HD Video(*.mp4)" under "HD Video" main category. Tip: Click the "Settings" button and customize proper video/audio parameters to get better playback effects on Samsung TV. Video size, bitrate and fame rate are flexible and can be adjusted as you like. 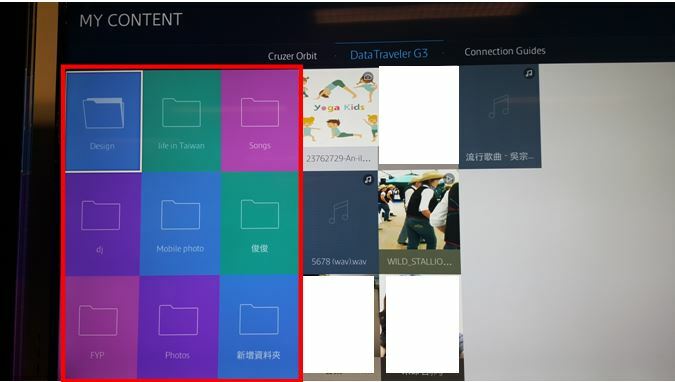 You can also directly output Samsung TV specially optimized file formats "Samsung TV(*.mp4)" under "TVS" main category. After all necessary settings, go back to the main interface and click "Convert" to begin ripping your DVD movies for playback on Samsung TV. When the ripping completes, you can click "Open Output Folder" button to located the ripped video files directly. After conversion, you can transfer all the output vidos to a USB drive and then play them on Samsung TV from USB port. 1. Plug a USB storage device into an USB port at the back of your Samsung TV. 2. Press the Source button on your remote. Then select USB Device USB. Or press the HOME button on your remote, nevigate to Source and choose USB Device. 4. Press the Enter button to show the control panel. Note:"USB" refers to "USB Storage Devices", but not any other devices connected with a USB cable.